The Falcon 50EX three-engined business jet. 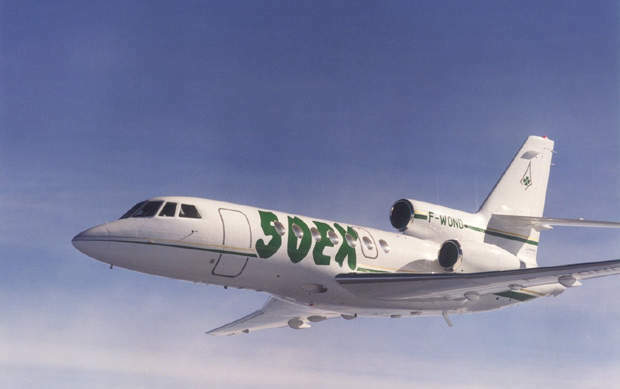 The Falcon 50EX entered service in 1997. 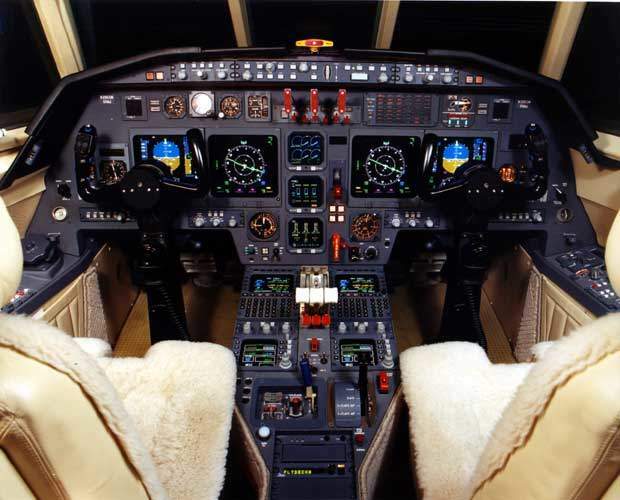 The cockpit avionics suite is the Rockwell Collins Pro Line 4. A maritime surveillance version, Falcon 50 Surmar, is in service with the French Navy. Falcon 50/50EX aircraft are in service with a number of governments for VIP transport. The 50EX is powered by three Honeywell TFE731-40 turbofan engines, each providing a thrust of 16.46kN. The 50EX can fly eight passengers 5,695km at 955km/h. The 50EX requires a runway length of 1,437m for taking off and 668m for landing. Over 330 Dassault Falcon 50 and Falcon 50EX business jets are in service. Over 330 Dassault Falcon 50 and Falcon 50EX three-engined business jets are in service. 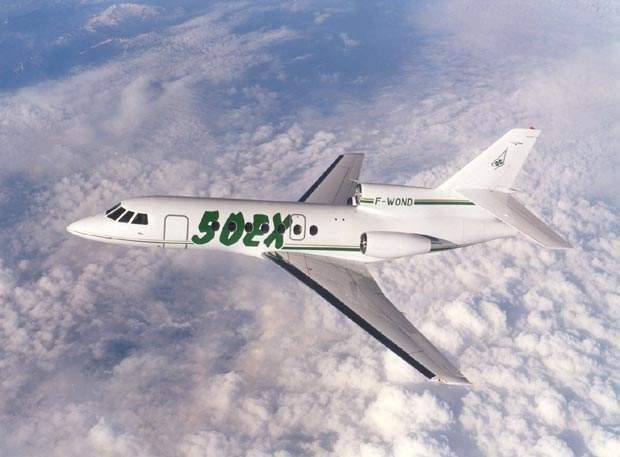 The Falcon 50, which first flew in 1976, is no longer in production. 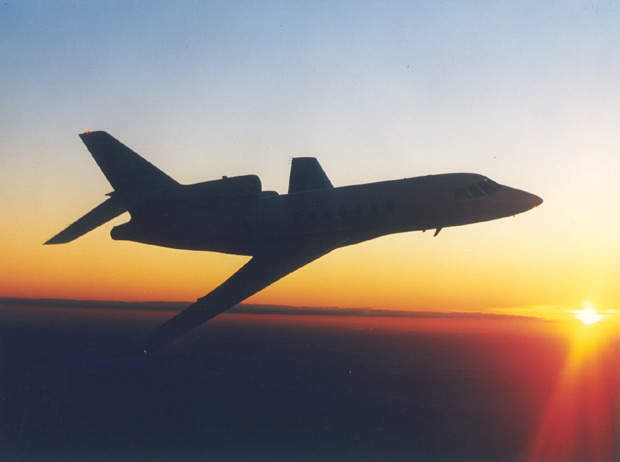 The long-range variant, the Falcon 50EX, first flew in 1996 and entered service in 1997. Over 80 Falcon 50EX have been delivered. 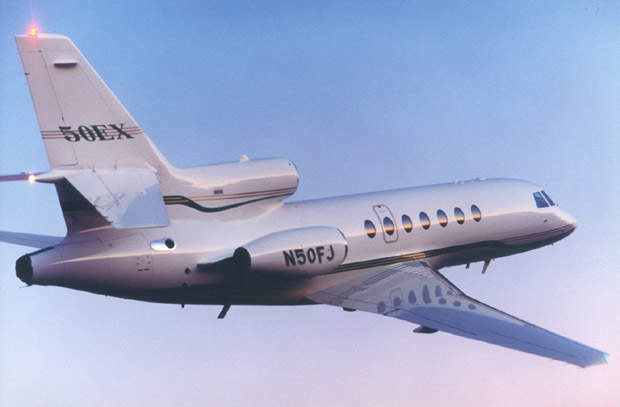 The Falcon 50EX will cease production in early 2008 when Dassault delivers the final aircraft. The Falcon 50EX can fly eight executives 5,695km (3,075nm) at 955km/h (Mach 0.8) non-stop and requires 1,437m (4,715ft) of runway with maximum gross take-off weight. The Falcon 50EX is one of a family of Falcon business jets which includes Falcon 2000, 2000EX, 2000DX, 900C, 900EX, 900DX and the latest member, the Falcon 7X. Dassault Aviation has a dedicated subsidiary for the Falcon family called the Dassault Falcon Jet Corporation. 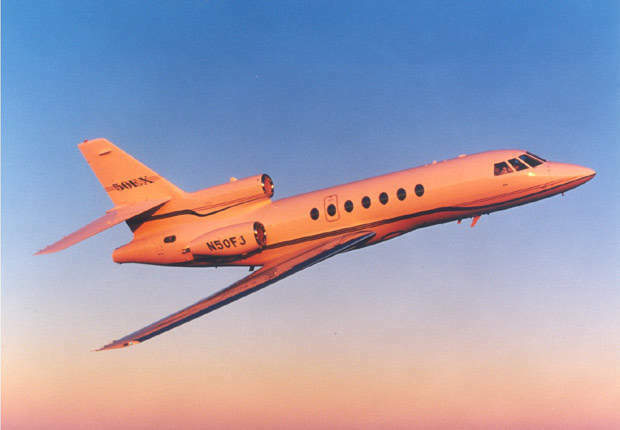 Over 1,500 Falcon jets have been delivered since the first Falcon 20 in 1963. 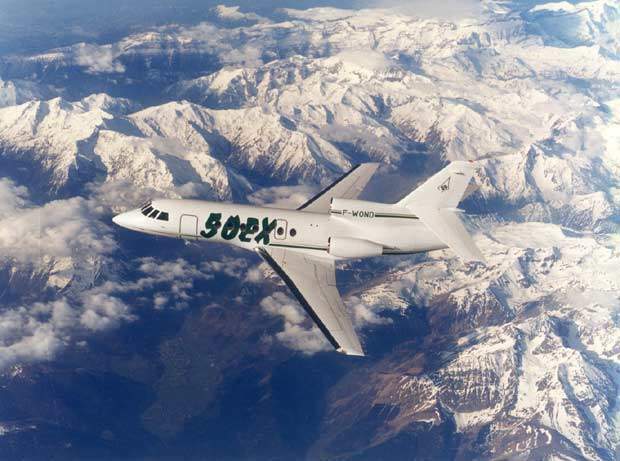 Falcon jets are built at Dassault production facilities in France and are then flown to the completion and service centre in Little Rock, Arkansas, where they are fitted to customer specifications. Falcon 50/50EX aircraft are in government and VIP service in Burundi, Djibouti, France, Iraq, Italy, Jordan, Libya, Morocco, Portugal, Rwanda, South Africa, Spain and Sudan. The Falcon 50 in service with the Italian Air Force can be converted quickly into medical evacuation (medevac) transporters. 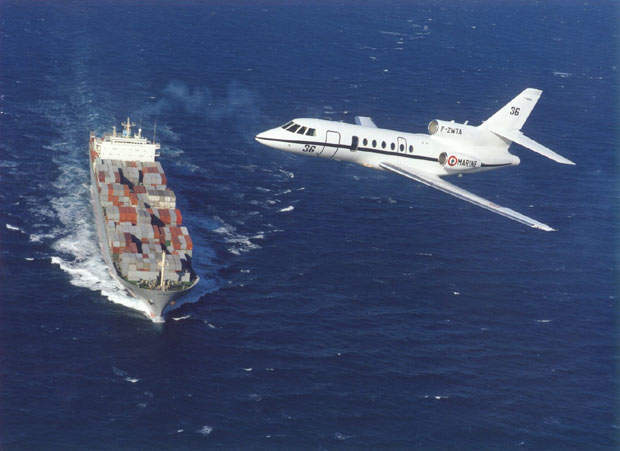 A maritime surveillance version, Falcon 50 Surmar, was developed for the French Navy and five aircraft were delivered in 2000 and 2001. The aircraft are equipped with a Thales Chlio forward-looking infrared, a Thales Ocean Master 100 search radar and three computerised mission stations. The aircraft can carry up to eight 25-man air-droppable life rafts. The two-crew flight deck is fitted with Sully Produits Speciaux windscreen panels, a Rockwell Collins Pro Line 4 electronic flight information system with four displays and a Thales (formerly Sextant) Avionique Engine Indicating Electronic Display (EIED) with a three-tube liquid crystal display. The aircraft is equipped with a Rockwell Collins APS-4000 autopilot linked to an ADC-850C air data system, dual FMS-6100 flight management systems with GPS (global positioning system), dual Honeywell EGPWS electronic ground proximity warning system with windshear detection and dual Honeywell Laseref III laser gyroscopes. The Falcon 50EX can be fitted with the Max-Vis EVS-1000 enhanced vision system to improve the pilot’s situational awareness. The cabin can seat nine passengers. The forward section of the cabin is a lounge area with four armchairs and tables. The rear section of the cabin is fitted with two armchairs, a table and a convertible three-seat sofa / single bed. Other layouts are available to accommodate up to 19 passengers. Cabin length is 7.16m, width is 1.86m and height is 1.80m. The 50EX aircraft has three Honeywell TFE731-40 turbofan engines each providing a thrust of 16.46kN. Two engines are pod mounted on the rear section of the fuselage. The third engine, mounted above the rear fuselage by two top mounts, is equipped with a thrust reverser. 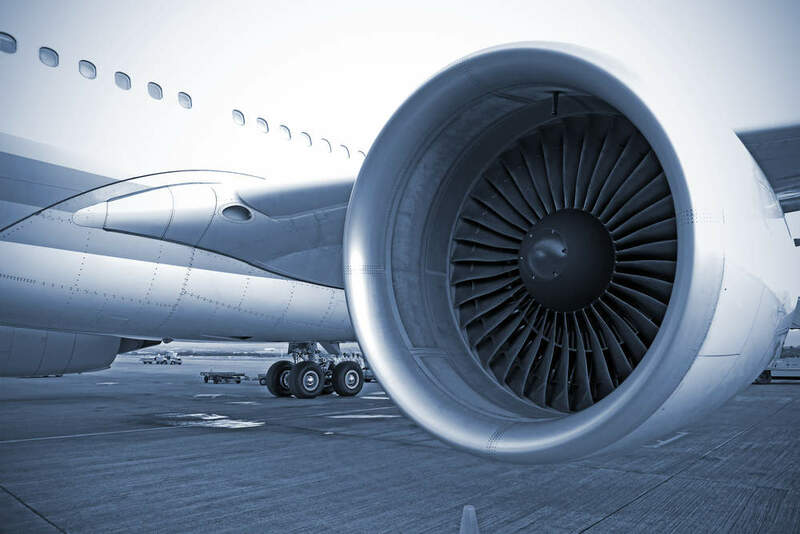 The engines are fitted with a Liebherr Aerospace, Toulouse, engine bleed air system. 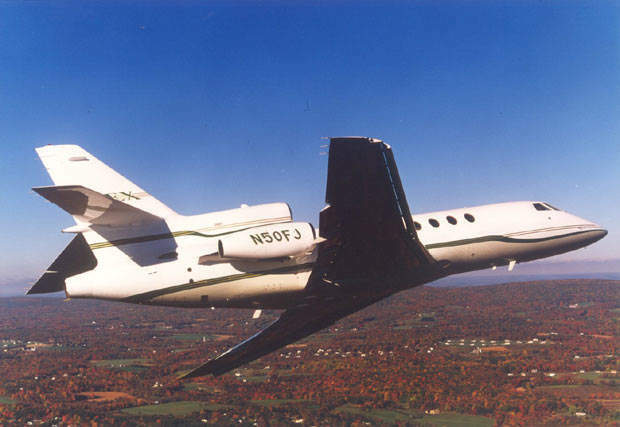 The Falcon 50 was powered by Honeywell TFE731-3 engines, which have a slower rate of climb and less thrust. The aircraft can be retrofitted with the more powerful engines of the 50EX. The integral wing tanks and fuselage tanks provide a total fuel capacity of 8,763ls. The fuel system is fitted with an Intertechnique fuel distribution system. The auxiliary power unit is a Honeywell 36-150 APU. The Messieur-Dowty retractable tricycle-type landing gear is fitted with hydraulic retraction. The main landing gear retracts inward and the nosewheel retracts forward. The ABS tubeless wheels are fitted with a four-disc braking system. The aircraft is equipped with two independent hydraulic systems by Messier-Bugatti and Vickers-Sterer.